Who doesn’t want to have flawless, soft and silky skin during the summer when it is so much on display! My little secret to perfect skin is Lush Ro’s Argan Body Conditioner. This little gem serves as conditioner not for your hair but for your body, leaving the skin feel and look SO soft and hydrated! I use it under the shower, right after I use my shower gel and I let it sit for a couple of minutes, then rinse and towel dry my skin. The results are absolutely amazing and I can’t stop stroking my skin haha. Not to mention that this stuff smells divine; it has the loveliest non-artificial rose scent with a hint of honey – YUM! <3 I definitely recommend this and even though it’s on the pricier side it’s totally worth it in my opinion! Speaking of clean and fresh scents I am in-love with this body mist by Victoria’s Secret. Aqua Kiss has a really light floral-y smell of “rain-kissed freesia and daisy” and it is the perfect refreshing summer fragrance in my opinion. This product is also infused with conditioning Aloe Vera and calming Chamomile, which energizes and calms the skin really nicely! I love to just spray this all over my body when I feel hot and it makes me instantly refreshed and smelling lovely! Definitely recommend checking this out and if you don’t have Victoria’s Secret near you check out other body mists because they are the perfect way to cool down during the hot, humid days! What is summer without bright, vivid nails I personally can’t imagine! I am such a nail polish lover and having fun nail polish on is a definite beauty essential! My favorite nail polish this season is Essie – Cute As A Button. It is such a gorgeous pinkish orange-y coral and it just resembles summer in my opinion! <3 I did a full review on it and you can see it here. For the summer I tend to go for really light foundation and the one that I really like is Maybelline Dream Fresh BB Cream. It feels really lightweight and it gives a lovely light to medium coverage. I love that this BB Cream evens out my skin tone and makes my face look so glowy and dewy without being it greasy or oily. I have the shade Light and it is a great match for my pale skin. This product is really hydrating but needs to be set with powder so that it stays on longer and I love using my Too Faced Primed &Poreless loose powder. This BB Cream also has SPF 30, which is great! :) I definitely recommend checking it out if you are on a hunt for new BB cream or lightweight foundation; it is really affordable and makes the skin look healthy and beautiful. I love your Dior lipgloss! 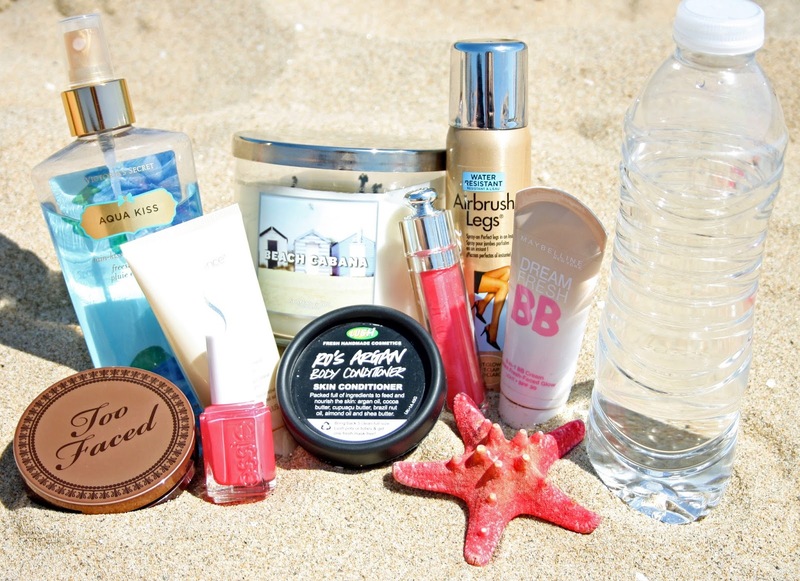 great essentials for the summer! I love Lush products and haven't yet tried the Ro's Argan body conditioner. Have to remember to check it out next time I'm in the store. fab products! I really want to try the bath and body works candles and the too faced bronzer is gorgeous. I'm using that Too faced bronzer as well, and I agree with you, it is awesome! i use the airbrush legs too! While at school my friends made fun of me because I used to carry (I do still) a 1,5 L bottle of water around with me and I was the only one being able to lift my bag without any problems, haha. Most people don't understand how anyone can drink that much but being used to it I find no difficulty in it. My body really demands that amount of water and I get thirstier much faster than anybody I know. 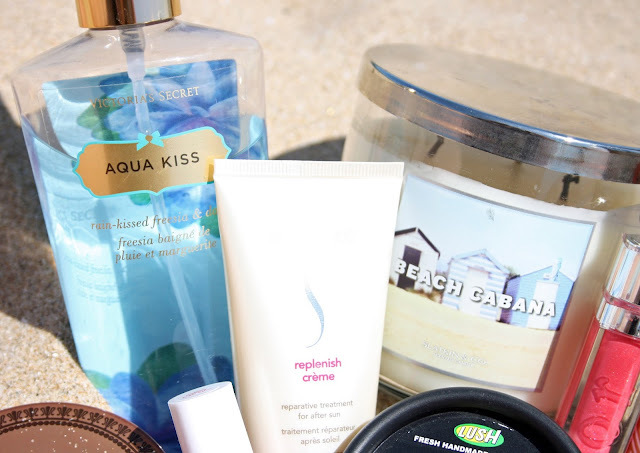 Do you have a favourite sunblocker? Great post - I've been looking for reviews on BB creams as I'm tempted to give one a go. 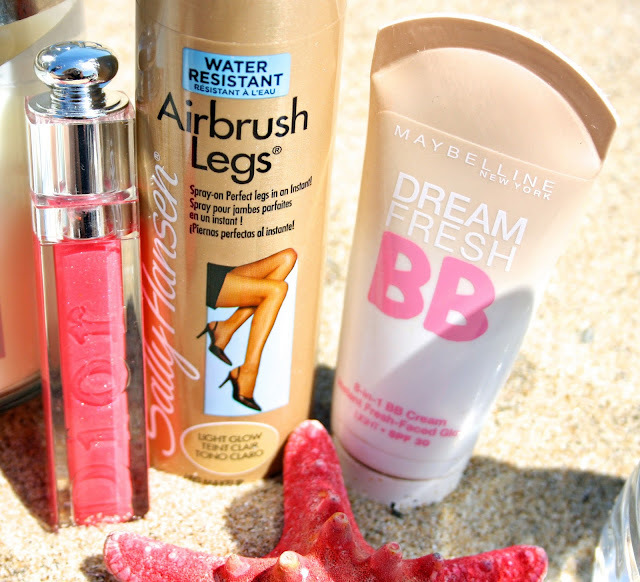 The Maybelline one sounds fab! I love Ro's Argan Body Conditioner! I can't wait to see your review on the Sally Hansen Airbrush Legs! Such a lovely post dear! I bet Victoria’s Secret Fragrance Mist in Aqua Kiss smells amazing. Sounds like a great summer scent. Ooh! I've heard good things about the Lush Ro’s Argan Body Conditioner. Lush has some amazing stuff! I'm checking out your blog after you left your lovely comment on my blog and I absolutely love it! I adore ro's argan conditioner, it smells divine!! I tried out the Lush body conditioner recently in store and I wish I'd bought it then! Definitely getting it next time, smells and feels amazing! I really want to try the body conditioner. It sounds so good! Lovely stuff! Goregous pics! You have an adorable blog! Would you like to follow each other? The photos are so pretty! :) I adore Lush products!♥ The body conditioner looks really good! Great post :)) Love it! Wonderful post! 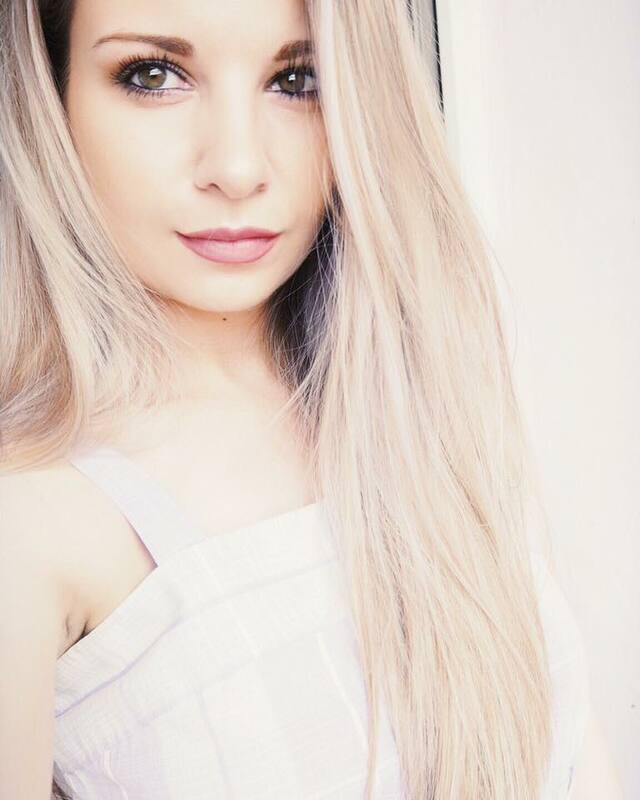 I love the colors, your pictures are so pretty! Chocolate soleil is my favorite bronzer! Unfortunetely they are hard to get over here :( I also love the essie color and the dior lipgloss haha they kind of match! That Dior gloss looks so pretty!! I recently tried the Maybelline BB cream after wanting to try it for a while and really am pleased with it :) I agree that the setting powder is a good idea otherwise the lasting power isn't the best. But still, a great product for the price! I can't live without Too Faced Chocolate Soleil Bronzer either! I use it everyday and it gives the perfect amount of color. 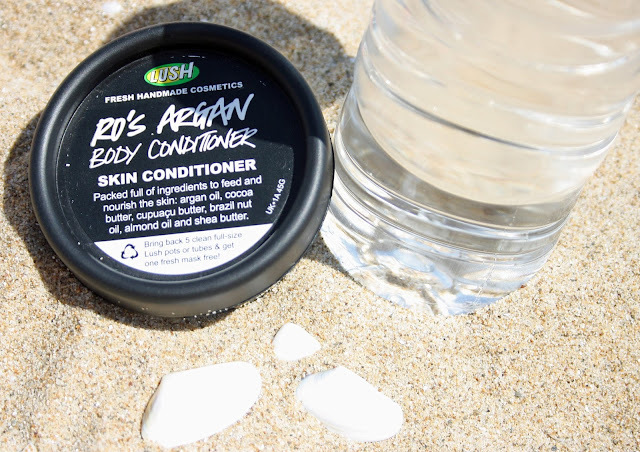 I have a post on my blog all about Lush products that I use but I have never tried Lush Ro's Argon Body Conditioner. I love their products and this one sounds divine! I will need to pick some up next time :-) Great post! I so need to get the sally hansen spray, I am super pale hahahah I definitely need that! Awesome review!!! I love all those products!!!! !